Missie Cindz - It's a Sheffield Food Adventure! - where will we next stop? My food-related rambling, obsessively taking pictures of what I’ve eaten and blogging about all things food is not only a hobby, but is integrated in my daily routines. I know, you should see the facial expressions on my friends when I’m shouting, “Wait, wait! !” just as they’re about to delve into our sharing platter to find me whipping out my camera. Tut, I hear? Maybe, but they’ve grown used to it now. I used to feel that Sheffield’s dining scene was unfairly hidden away (an underbelly if you will) – but my ‘nomming’ road trips across the City has lead me to discover an ever increasing supply of locally-sourced treats, delicious eating venues, food producers and farmers – some of whom I would also call ‘friend’. Those sausage rolls from Gregg’s simply won’t cut it – because I’ve been constantly impressed by the growing deluge of homemade, Sheffield-sourced deli’s available in the city centre. Lunch times have become a nightmare, what with so many eateries offering their delightful and colourful meal boxes – as a city, we’re spoilt for choice. 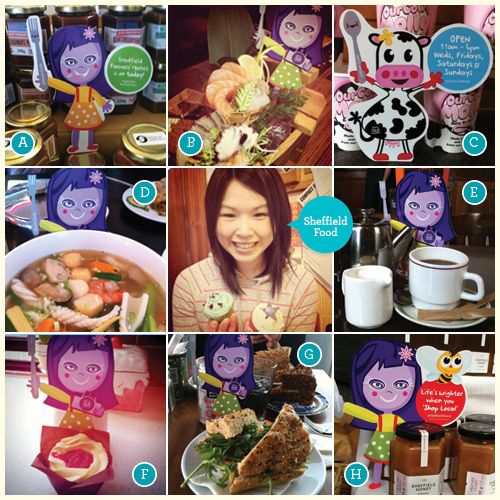 I’m having a very tasty time on my Food Adventures – gallivanting up and down Sheffield on my smiley fork. It’s proving a delicious experience, just take a look at my photos (seen above) and you can see that I’m eating my way through Sheffield! If you happen to see Missie in your local eating joint, remember to tweet me over a photo (I’m always keen to find out where Missie hangs out), and add with your tweet the conversation hash tag #missiesfoodadventures so that we can all follow her food/road trips. 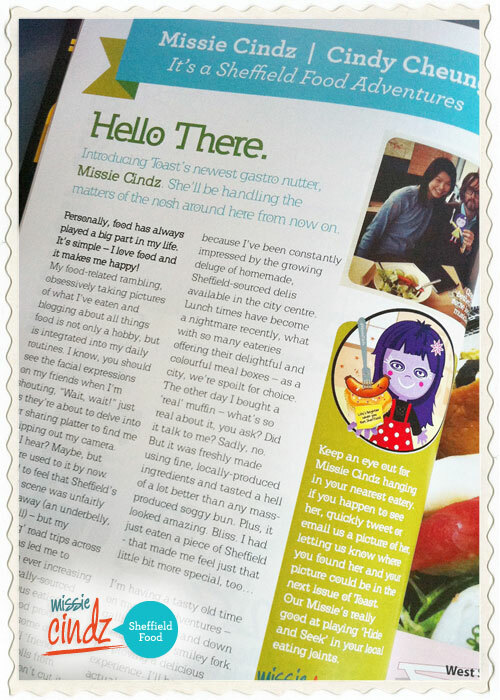 If you pick up this month’s issue of Toast Magazine, you can find my first ‘Missie Cindz Food Adventures’ guest article for them (see photo above). It’s all very exciting stuff. But to read the full article, you’ll have to pick up a free copy yourself. Toast is one of Sheffield’s lifestyle and culture magazines where they cover everything from food, fashion and music, you’d be able to find it in most independent shops in Sheffield city center. If you have trouble finding a copy, just send me a tweet or email.